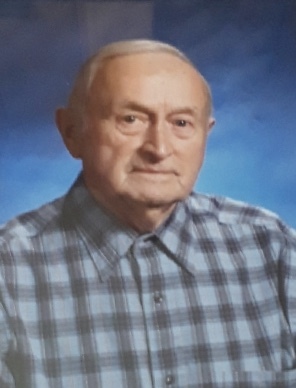 Richard L. Cloud, 97, of Manns Choice, went to be with his Lord and Savior on Friday, April 5, 2019 at UPMC Bedford Memorial Hospital, Snake Spring Twp., PA.
Mr. Cloud was born in Buffalo Mills on November 20, 1921, son of the late Strothers and Margaret (Frazier) Cloud. In 1948 Richard married Marcella J. (Wertz) Cloud. She preceded him in death on April 2, 1992. Richard is survived by: Son- Richard V. husband of Linda (Miller) Cloud, Manns Choice; Son- Craig E. husband of Connie (Stapleton) Cloud, Saxton; Granddaughter- Christy wife of Mike Shippy, Manns Choice; Grandson- Garret husband of Erica Cloud, Saxton; Grandson- Eric Raley husband of Angela, Coalport; Granddaughter- Lori wife of Norman Rose, Bedford; Granddaughter- Jenna wife of Justin Claar, Osterburg; Great-grandchildren Mason, Max, Zoe, Kaleb, Cole, Leah, Austin and Adrianna; Girlfriend Ruth Hannold, Bedford. Mr. Cloud is preceded in death by brothers Melvin, Paul and Homer Cloud and Sister Leona Mauck. He retired from the PA Turnpike Commission where he was employed as an Operator. Richard served as a PFC in the U.S. Army during WW II and was recognized and honored with the Asiatic-Pacific Theater Ribbon. He was a member of The Manns Choice Church of God. Richard was an avid Pittsburgh Pirates fan. He also was an avid hunter and fisherman and loved to hunt ginseng and mushrooms. Friends will be received on Tuesday, April 9, 2019 from 6-8 PM at the Mickle-Geisel Funeral Home, Schellsburg. A funeral service will be held at Manns Choice Church of God at 10:30 AM on Wednesday, April 10, 2019 with Pastor Aaron Whetstone and Pastor Richard Whetstone officiating. Interment at Milligans Cove Cemetery, Buffalo Mills. Military Rights accorded by Fort Bedford Honor Guard.